My mom gave me a tattered copy of The Art of Mexican Cooking, a cookbook by Diana Kennedy. Kennedy, a James Beard Award-winner and one of the authorities on Mexican cuisine, knows her stuff. Many of the recipes in the book called for long lists of unfamiliar ingredients and required multiple steps, but the slow cooker refried beans were simple, so I started with those. I removed any stones and soaked dry beans overnight, cooked them on the stovetop for several hours with an onion, then mashed and fried them in a little bacon fat. The rich, savory refried beans that resulted were a revelation. You’ll need a handful of ingredients, a slow-cooker, and some time. Dry beans usually need to soak for several hours and then take several more hours to cook, but with a slow cooker, you can skip the soaking step and cook them overnight or while you’re at work. 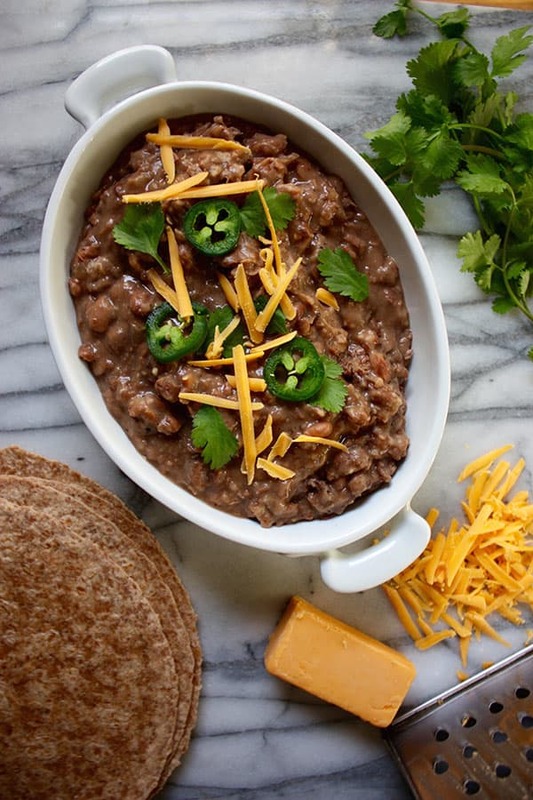 Once you’ve tasted these homemade slow cooker refried beans, and see how effortless they are to make, you’ll say buh-bye those mushy canned refried beans for good. 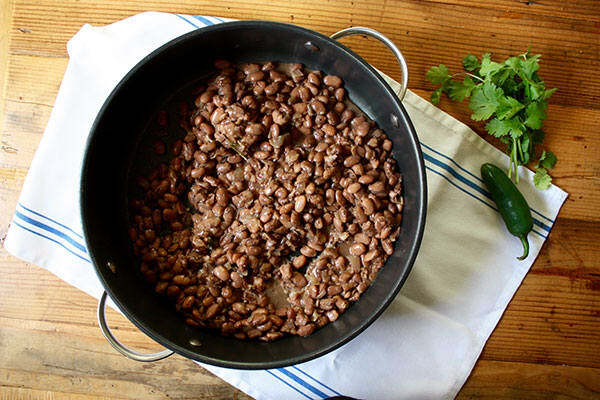 In this refried beans recipe, dry pinto beans, onion, garlic, and spices simmer in a slow-cooker for six to eight hours until the beans are tender and infused with the flavor of epazote, a common Mexican herb. (Can’t find epazote? Try oregano.) They can be eaten whole or crushed with a potato masher. This recipe makes 12 servings, so it’s great for feeding a hungry family or a crowd of friends. It’s also a good choice for meal prep! Spoon individual servings into freezer-safe plastic bags and freeze for up to 3 months. 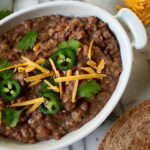 Simply reheat the slow cooker refried beans in a microwave, or thaw and heat on a stovetop, adding a little water if needed to get the desired consistency. Pro tip: Sorting dry beans before cooking is an important step that should never be skipped. The harvesting process can leave debris like sticks, rocks, and who-knows-what-else mixed in with beans. Spread beans in a single layer on a kitchen towel or baking sheet and scan them for any odd shapes or colors. These delicious slow cooker refried beans combine onion, garlic, salt, pepper, and a dash of heat and freeze well for later too! Place beans, onion, garlic, ¾ tsp. salt, pepper, espazote, red pepper, and 4 cups water in a 3-quart slow cooker; cover. Cook on high for 6 to 8 hours, or until beans are soft. Add additional water, if necessary, so that beans do not become dry. Remove and discard espazote sprig. Strain beans, reserving liquid. Heat oil in large, heavy skillet over medium-high heat. Add strained beans and ¼ cup of reserved liquid; cook, mashing with a potato masher, for 5 to 8 minutes, or until they form a rough purée. Add more water if necessary to keep the fried beans from getting too dried out. Season with remaining ¼ tsp. salt; mix well. A great FFC option as part of breakfast or lunch. For the vegan plan, makes a great protein.